Anglers have reported good success fishing from a boat for saugeye using jigs. Fishing for crappies remains slow. A few channel catfish are being caught as of recently. The lake levels remain high. The high water boat ramp is now usable. Trout angling from shore and boat remains fair at Clear Creek Reservoir. Trout fishing has been the best early in the day. Anglers are still catching a few 18 to 25-inch rainbow trout along with 8 to 12-inch rainbow trout. Shore fishing access at the boat ramp parking area has been reduced because of both high water levels and willows right at the shoreline. Shore anglers caught several trout on a worm and bobber combination. Black woolly buggers have been the most productive fly for fly anglers. Under less windy conditions, fly anglers caught trout on a dry dropper rigs. Boat anglers targeting trout with lures experienced success on jointed Rapala's, pink Tasmanian Devil's, Kastmasters, and rainbow-colored spoons. Boat anglers employing bait had the best success with red, white, and blue PowerBait. The kokanee salmon fishing has been very slow. A fly angler landed a 17 inch tiger muskie on a woolly bugger. A few boat anglers reported tiger muskie striking Rapala's at the eastern part of the reservoir. The reservoir is closed to trailered motorized watercrafts on Tuesdays and Wednesdays. The current boating hours are from 6 a.m. to 8 p.m.
Anglers have had good success fishing for wipers from shore. Anglers using jigs, minnows, and spinners are catching wipers in the 12 to 15 inch range. Fishing for all other species is slow. Fishing at Merideth has been slow recently. The boat ramp is now usable at the lake. Fishing has been fair for trout with anglers having the most success during the morning and evening hours. Several large brood trout have been caught and the pan fish are getting caught during the warmer part of the day. Fishing has recently slowed down with the warmer days and the water level going up. Fishing has slowed down recently with the increased water levels as a result of the increased river flows. Anglers are still catching some trout and pan fish at pond one and are also catching some pan fish and bass at ponds two and three. A few anglers have been fishing primarily upper Queens Reservoir, but have not had luck catching any fish yet. 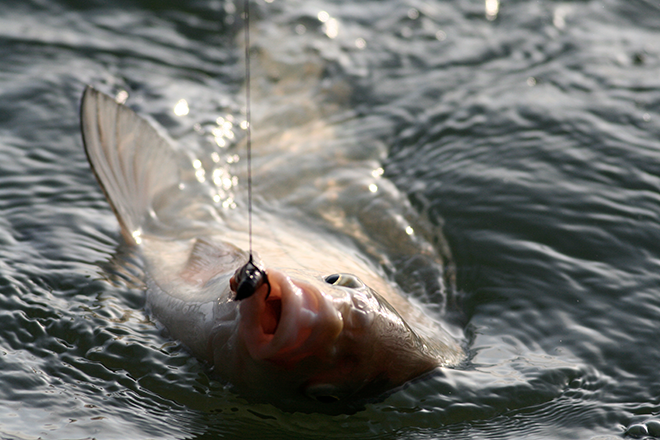 Anglers have been reporting seeing a lot of large carp in the reservoir. Increased water levels allow for the launching of boats from the west ramp, but the south ramp is completely under water and not accessible at this time. Boaters are urged to use caution as there is floating debris and unmarked obstacles. The lake is currently at 924 surface acres with a surface water temperature near 60 degrees. Shoreline anglers are still catching trout on most parts of the lake using various PowerBait and homemade dough baits. We are getting reports of smallmouth bass biting on lures and jigs near the east end of the South Shore. We are also getting more reports on walleye being caught from shore jigging. Some good catfish are being caught from shore in Reilly Canyon using chicken liver. Boaters are still having success catching walleye, bass, perch, and trout. The walleye have moved into shallower water as of recently. The walleye are being caught using jigs and artificial minnows. The perch are also being caught using jigs. The lake is still low, but the boat ramp at Matchless is now open. The fishing from shore is really good for both rainbow trout and lake trout. Anglers are catching fish on assorted baits, lures and flies.